Get the Book that Launched this Revolutionary Method to Sell Your Home in 5 Days! Learn how to sell your home in 5 days, get a fair market value, and avoid broker fees using the proven 5 Day Sale Method. In any location, with any economy, this effective book has helped owners sell their home for over 12 years! 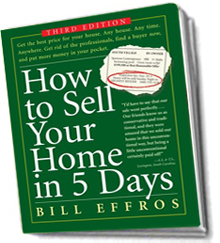 It is the go-to resource to learn how to sell your home in 5 days! We recommend that you buy the book…read the book…and then call George Cappony for your FREE 30 minute consultation.